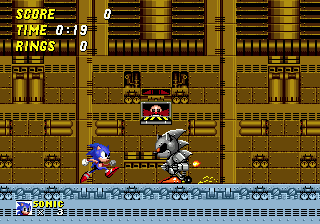 For the Sonic & Knuckles level, see Death Egg Zone (Sonic & Knuckles). For other uses, see Death Egg (disambiguation). Death Egg Zone is the 11th and final zone in Sonic 2, taking place on the Death Egg. This level shares layout tiles and a palette with Chemical Plant Zone. This zone consists only of two short walkways leading up to two boss battles. Mecha Sonic is a robot version of Sonic. You can win this one in 15 seconds. Just hit him 4 times as soon as he comes down, and then another 4 when he goes off to the other side of the screen. Not that the scientist isn’t a bloated whale already, you might think, but this is even worse. As if Eggman has taken the idea of a metal Sonic, decided there had to be a metal Robotnik to balance things out, and then gone insane with egomania. This mecha towers over twenty metres tall, bristling with antennae and sensor dishes. Its torso is spherical, with red and yellow paintwork mimicking the Doctor’s own jumpsuit. Immense robotic limbs branch from the central mass, secondary motors roaring as the arms swing and titanic feet ram down one in front of the other. A pink dome of a head bulges out from the top of the central sphere; vast metallic moustache twitching back and forth beneath its pointed nose. It's the final battle! This giant Eggman mech is debatably the hardest boss stage in Sonic 2. With no rings at all, one hit will end it for the spiky blue hero. Robotnik's attacks include launching his arms like rockets, trying to stamp on you, and dropping right on your head with his targetted slamdown. Also, don't get caught behind the robot - Dr. Robotnik launches a pair of grenades at you which pretty much guarantee death. Just be patient, and restrict yourself to attacking the head only when the mecha bows its feet after landing from one of its jetpack flights. After 12 hits, if you have all seven emeralds, the good ending is unlocked. If the player defeats this boss, the Death Egg explodes, and Sonic just about survives by hurling himself out of an airlock into space. Looking like the end for Sonic as he descends through the stratosphere, Tails appears and catches Sonic on the Tornado, thus ending the game. The good ending shows Super Sonic flying by the Tornado, instead of Tails catching Sonic. If this zone is "cleared" by placing a signpost or a capsule in the 2013 version of the game, the game will load Hidden Palace Zone. This page was last edited on 5 August 2018, at 18:47.